Aren't you sick and tired of those "NEET", or niito ニート, characters showing up in anime and then doing absolutely nothing? Just like a NEET would? Because they are... you know, NEETs? No? But do you at least know what NEET means in Japanese and what NEET characters are like?? Are All Unemployed People NEETs? 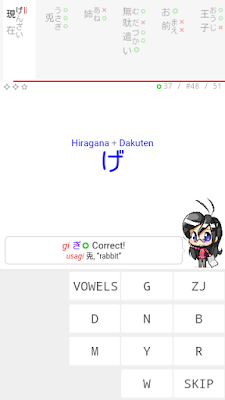 NEET is English or Japanese? 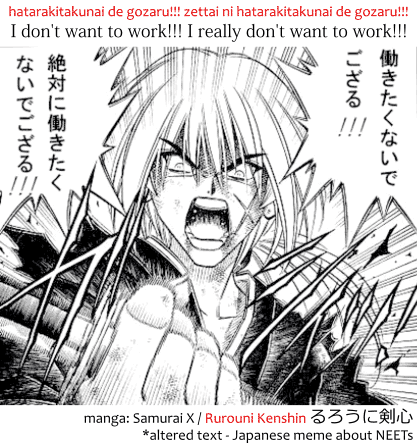 A NEET character, or a NEET in real life, or at least a NEET in Japan, is someone who has already finished his studies, is unemployed, and doesn't seem willing to look for a job and start working. That is, a NEET is basically lazy bum usually living off their parents' expense and does nothing all day long. You're useless and aren't contributing to society. You're scum. You're a NEET. The word NEET is actually an acronym. NEET stands for Not in Employment, Education or Training. Which is verbatim what are NEETs are like. They have no jobs, so not in employed, finished their studies or dropped out, so not in education, and aren't being learning the ways of any profession or career, so not in training. Basically, NEET means you're not making any progress in your life professionally. Do note that by the definition above, any unemployed person who already finished his studies and is looking for a job would be a NEET. However, if you're looking for a job, you wouldn't be called a NEET, because it looks like you actually want to work. A person who's just "unemployed" is called mushokusha 無職者, written with the kanji for nothing 無, occupation 職, and person 者. A real NEET isn't simply not working, he does not want to work. He wants to be useless. It's this attitude that makes NEETs NEETs. One strange thing is that the word NEET, being an acronym, is clearly in English, not in Japanese. So why do you hear it so much in anime and never anywhere else? The word appears to have been coined in England and used in some official government projects for the good of the public. It was then used by Japan and that's how it got popular there. 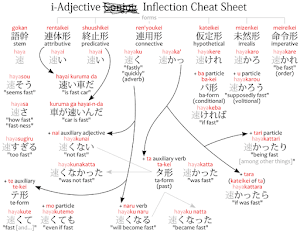 Ironically, as far as I'm concerned the only people who say "NEET" outside of Japan have heard the word in Japanese anime or some English-speaking forum about anime. So maybe the word isn't really used outside of anime in English speaking countries anymore. Many times in anime you have a character who is both a NEET and an otaku オタク. That is, he doesn't have a job and isn't in school, but somehow he can afford to pay for those outrageously expensive anime blurays, hundreds of volumes of manga, a number of games and game consoles, high-quality dolls figurines for collectors, and so on. This is merely a coincidence. That is, a character can be an otaku without being a NEET, and he can be a NEET without being an otaku. They are not mutually exclusive nor does one requires the other. It just happens that often a character that is an otaku is also a NEET. For example, in Gate: Jieitai Kanochi nite, Kaku Tatakaeri ゲート 自衛隊 彼の地にて、斯く戦えり (Gate: Thus the JSDF Fought There), the protagonist, Itami Youji 伊丹 耀司, makes a point in saying all the time he works for the army in order to maintain his doujinshi addiction pay for his hobby. In Knight's & Magic, the protagonist (before dying) worked as programmer to pay for his robot models. Both characters were otaku but not a NEET as they actually had jobs. 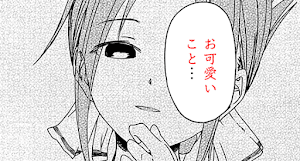 The word NEET is not synonymous with hikikomori 引きこもり either. 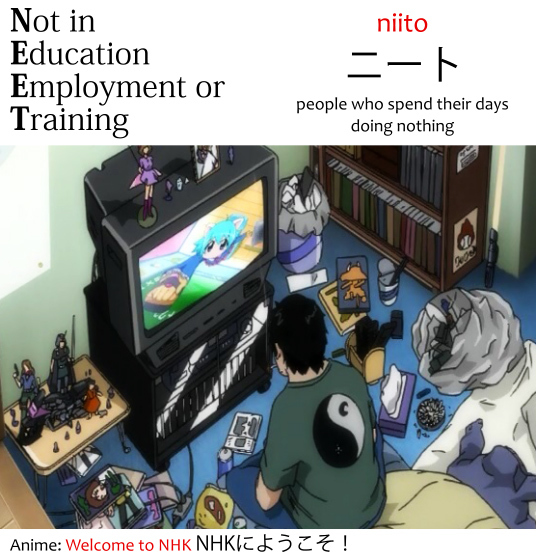 A hikikomori is usually a NEET, but some NEET don't even have where to hikikomoru into, so they can't be all be hikikomori. That is, because a hikikomori is a shut-in, he doesn't leave his house or maybe even his room. If he doesn't leave his house, it's unlikely he'll be able to have a job at all or even go to school. This is why most hikikomori depicted in anime and manga also happen to be NEET characters as a consequence. However, just because a character is a NEET that doesn't mean he's a hikikomori. For example, he could be a lazy bum that liked to party a lot. He could be from a rich family that allowed that sort of lifestyle. He could also simply not be able to shut himself into his room because he doesn't even have a house, since he can't afford it because he has no job. To have an idea of a character who is a NEET, but is not a hikikomori and is not an otaku, think about Hasegawa Taizou 長谷川 泰三 from the anime Gintama 銀魂, also notoriously known by the affectionate nickname MADAO. There's also a special kind of NEET called "elite NEET," or eriito niito エリートニート. What means to be "elite" varies, but it essentially refers to someone who is, thinks he is, or is expected to be, better than the normal person, mostly due to their income, prestige and accomplishments. 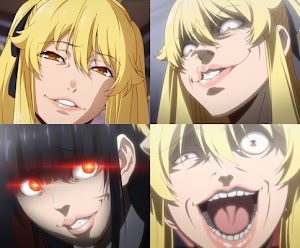 In the first case, it refers to a NEET from an elite family (rich), who, despite reputation, resources and connections, and the likelihood of becoming a boss of a company or two, decided not to live up to the expectation of them and descended into becoming an useless trash that's a NEET. It can also refer to someone with incredible academic scores, an elite student, which one would have expected to have a great career, but instead of working and becoming a star in their field, became a NEET after finishing school, or maybe didn't even finish, or got a job and stopped or something like that. Further, it can mean someone from a high-income career, like a doctor, lawyer, CEO, etc. who has stopped working their elite jobs and became NEETs. In the second case, it refers to someone who maintains the pride of being elite despite not studying, working or doing anything at all. This is a self-image question. Most NEETs think of themselves as useless and recognize they are, in fact, the scum of society, and maybe even that they need some sort of mental health help. However, NEETs that are also elite do not think that. They don't think they're inferior to the people who actually work, they think they are better than them. This is because these elite NEETs have either a passive income in the form of properties, stocks or businesses that allows them to live comfortably despite being bums, or, in the case of elite students, they think of themselves as smarter than the average person, and often are told so. These things validate their elite status. NEETs are, justifiably, regarded a societal problem in Japan and in pretty much everywhere in the world (except they won't use the word NEET). Because of that, many anime have NEET characters, plot arcs based upon the concept of NEET, and some go as far as being entirely about NEETs. Such is the case of the manga and anime "Welcome to NHK!" NHK ni Youkoso! NHKにようこそ！ Which shows how a severely socially anxious character lives his paranoia-filled life. 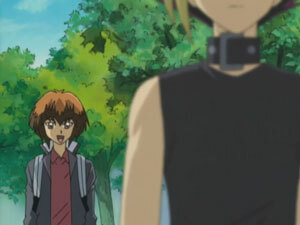 And how this paranoia made him into a NEET. Thanks for the info, was wondering what an elite neet was. Interesting that there seem to be varying definitions.